Have you done anything with the leaves of the Root Beer Plant yet? That’s the package of heart-shaped leaves that was in last week’s CSA share box. They are reminiscent of the Piper Betel leaves that we got a couple times, before the freeze hit. These leaves are Piper Auritum (or Piper Sanctum), commonly known as hoja santa, and they taste like anise or root beer, thus the name. The hoja santa came from Possum Trot Tropical Fruit Nursery, of course. It’s one of several different varieties of Piper that Robert Barnum has been growing for years. I called him up and asked what he does with it. He puts it in baked beans, or uses it to wrap fish and then bake it. He also suggested making a pesto, then spooning a bit over cream soup and using a toothpick to make swirly designs. Yup, that’s what he told me. One of the CSA bloggers, Chef Caroline over at Occasional Omnivore, used the leaves to wrap tamales that she cooked on a grill pan. Her recipe sounds delicious and easy to do. Check it out here. Still haven’t used much of mine, in case you were wondering. I chopped up one leaf and tossed it in with some spring onion in scrambled eggs the other day for breakfast. That was good, but P. betel would have been better. Chopped up another two leaves and used them in a saute of onion, tomato, and chicken, seasoned with a pinch of cinnamon, salt and pepper. That was good, but it tasted like it was missing something. Any suggestions? If you want grow your own, contact Robert Barnum at 305-235-1768 to purchase hoja santa plants. Or, you can contact Farmer Margie at office(at)beeheavenfarm.com if you want to buy some leaves. Have you considered making faux root beer with them? Make an infusion, add sugar, cook it down to a syrup, stir into seltzer. If I hadn’t missed last week, I probably would have made ice cream with them. Or maybe made them part of a barbeque sauce where I could balance the sweet spiciness with smokiness and heat. I wrapped Halibut with the Hoja Santa, put some sauteed shallots, and garlic, and roast it, they came out great. Also known as “Root Beer Plant,” Mexican Pepperleaf, False Kava and Hoja Santa, this member of the pepper family is used chopped for flavoring as well as a wrap for meats, cheeses and tamales. Hoja Santa is native to tropical America, ranging from Mexico to Colombia. Pescado en Hoja Santa” is a typical dish from Veracruz. 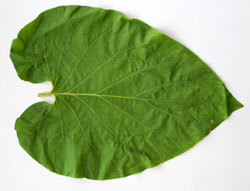 If you want to try hoja santa leaves, let Margie know at office(at)beeheavenfarm.com. Take a look at my Thai blog post to see how I ate them recently while in Sydney. Hint: scallop, toasted coconut, kaffir lime! I’m still dreaming of this dish! I think I’m going to wrap some ground bison in them and bake them? Not sure but will let you know! I found a recipe that looks easy and uses my green onions from the farm today too. Lemongrass and beef, Vietnamese style by Chef Nguyen, he’s excellent and offers a video too. Went to his restaurant in Sydney, will let you know how they turn out! Was that the smoky flavored piper betel leaves that we got in our share boxes earlier this season? Where can one find Kaffir lime leaves? Thanks for sharing the video. That looks fun and easy to do! Let me know how it turns out. Interesting that betel leaf is used as a wrap rather than a minced or shredded ingredient. Marian I’m working on the kaffir lime supplier. I went to an Aisan grocery on Friday and they said they never carried them and I can’t remember where I got some before. Will keep you posted. The wraps were very tasty! I’ve sent an email to a friend who might know where to get some kaffir lime leaves. Could one use a substitute, or is it just one of those ingredients that you just gotta have? No, Marian, there really is no substitute for kaffir lime, the leaves are so unusual. They are best used fresh and you could probably get a tree if you have a back yard with sun. I used to have one but I have a balcony with no sun whatsoever. I have a friend who is Thai, I think she has a website for Thai food products and she works in a Thai restaurant. I just wrote her to find out where people can get them. Will keep you posted! Also called sacred pepper, thanepa, momo, and yerba santa, this large valentine-shaped velvety green leaf with a light green underside has a strong anise scent and anise, nutmeg and black pepper flavor. This herb makes a fragrant wrapper for grilled or steamed fish and is also used in Mexican cuisine in green moles, pipian verde (with pumpkin seeds),beef, chicken and shrimp dishes. Fresh leaves are best to use but dried ones are sold in Mexican markets and are best used ground in sauces as they are too brittle to use as a wrapper. Kaffir lime leaves are called magroot in Thai and come from a warty Southeast Asian citrus. They impart a unique lemon-lime perfume and also add zing to soups, sauces, curry pastes, and other dishes. They are used like a bay leaf–added whole to impart flavor but discarded and not eaten unless finely cut into shreds with scissors and added raw to salads. The leaves are sold frozen in most Asian markets and should be stored in the freezer until using one or two for a dish. This keeps the essential oils fresh. If dried leaves are found, they will not have much flavor so use fresh or frozen. I’ve heard it referred to as ‘the money tree’ because the leaves are so expensive. There aren’t many to be found around here, previously because of the previous citrus canker problem and now because citrus greening is killing what’s left. We had a small kaffir lime tree some years back, and the Katrina/Wilma double whammy stressed it to death. I wouldn’t recommend buying any citrus trees at this time, at least not until the whole greening thing settles down. I have seen frozen leaves at a couple of Asian markets-you need to get friendly with the proprietors and ask-it might be seasonal. Your best bet is finding a store that has a nearby restaurant they also supply. Yes, sometimes I get them from a restaurant I’m dining at. The friend of mine is Thai and she used to sell them on her website but is not doing it any longer. She said she’d get some for me. I don’t see why you couldn’t get a small tree for your own use? I had mine in a pot, it was only about a foot when I bought it. I think you can order them online for about $20 or so. You can use them frozen but fresh is really the way to go. I’m going to get one for my friend’s garden, she has a house and has agreed to “share” it with me! Meanwhile, i’ll check at the Veitnamese place on 163rd, thanks!